This portrait of an Afro-Indian leader from Ecuador, his son and a companion, commemorates their support of Spanish rule. 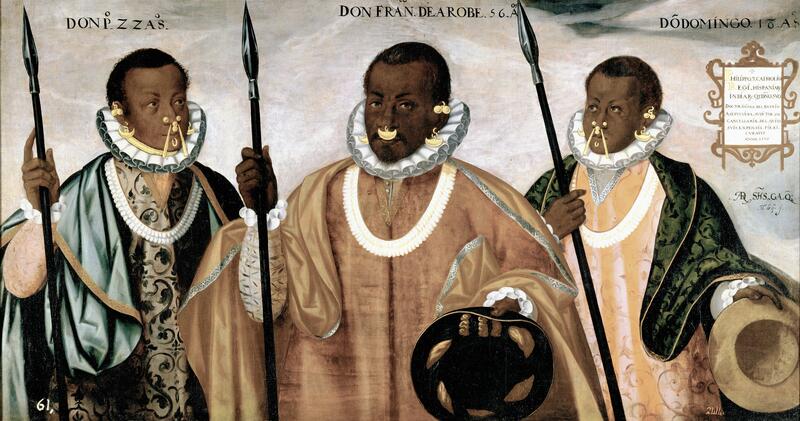 Don Francisco de Arobe, pictured at center, was the governor of a town of some 500 people on the Ecuadorian coast who, in the late 16th century, agreed to recognize Spanish rule. Shortly thereafter, this portrait was commissioned by a colonial official in Quito, Ecuador, as a gift for King of Spain, Philip III. The particular identity of these three men as being from Ecuador's coast is marked by their shell necklaces and gold face ornaments. Large Spanish-style ruffs surround the sitters’ necks, while loose indigenous ponchos cover their bodies. Such rich garb—clothing no doubt adopted for the portrait— was the privilege of indigenous elites, who drew on clothing traditions that signified power within both Spanish and indigenous traditions. At center, is don Francisco de Arobe. To the viewer's left is don Pedro, his son, whose age is given as 22 years. Another young man, don Domingo, 18 years old, stands on the other side. At the upper right, the inscription registers the names of King Philip III, the intended recipient of the portrait, and Juan del Barrio de Sepúlveda, the colonial official in Quito who commissioned it. The date of the work, 1599 is also recorded here. Below the cartouche, the painter’s name, Andrés Sánchez Gallque, appears in a highly abbreviated, and sophisticated, calligraphic form. The portrait was commissioned by Juan del Barrio de Sepúlveda, a high ranking Spanish official, as a gift to the King of Spain. The portrait was created when don Francisco de Arobe, who is pictured at the center, and his retinue came to Quito in 1599. Two years earlier, Barrio had been instrumental in Arobe’s acceptance of Spanish rule and this painting records his feat. The artist, Andre Sánchez Gallque, was an indigenous man born in Quito and trained to paint by friars. 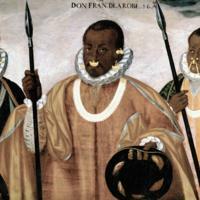 He belonged to the Cofradía of the Rosary, which had branches for Indians, Africans and Spaniards. In the 18th century, cofradía members sponsored the magnificent Chapel of the Rosary in Quito’s Santo Domingo. Sánchez Gallque’s work and career suggest how interactions among people of different ancestry and traditions contributed to both the visual culture and lived experiences of Spanish America. The painting is oil on canvas, a technique brought to Spanish America from Europe, allowing the creation of vivid and portable images. This work measures 92 x 175 cm (36 ¼ x 69 inches). This horizontal, half-figure format of the portrait is unusual and may have been cut down from a larger original. Close examination of the original work suggests another, earlier painting may rest below this one. Although painted by a well-trained artisan of some repute in Quito, the painting was of ethnographic, rather than artistic, interest to the Spanish government. Today, much of the royal collection of curiosities from the New World—of which this was once part—is now housed in the Museo de América in Madrid. This painting oscillates between a portrait—a work designed to pay homage to its subject—and a document of a historical event—in this case, the agreement by don Francisco to recognize Spanish rule. Given the proud stance of don Francisco, his show of military readiness, and his elegantly arrayed figure, he is hardly the defeated subject. Cummins, Tom. 2013. "Three Gentlemen from Esmeraldas: A Portrait Fit for a King." In Slave Portraiture in the Atlantic World, Agnes Lugo-Ortiz and Angela Rosenthal, eds. Cambridge: Cambridge University Press, 119-145. Webster, Susan. 2014. "Of Signatures and Status: Andrés Sánchez Gallque and Contemporary Painters in Early Colonial Quito." Americas 70 (4): 603-644.